Utahns in the beer industry are worried craft brews will soon be pricier—and drinkers might have to pick up the tab. After winning the U.S. presidential election in November 2016, Donald Trump pledged to unite a fractured country whose political parties were deeply split. Almost two years later, he could end up bringing together another diverse group of partygoers—beer drinkers. Whether they prefer saisons or lagers, ambers or IPAs, pale ales or porters, drinking buddies with arrays of alcoholic preferences might soon be united by their disdain of higher prices for their brews of choice. In March, Trump announced a 25 percent tariff on steel and a 10 percent tariff on aluminum, but he issued temporary exemptions for Canada, the European Union and Mexico. On the last day of May, Commerce Secretary Wilbur Ross said those allies would also be subjected to the trade penalties as of June 1. A few months in, the metallic trade war's results are already being felt nationwide—Coca-Cola recently said there would be a hike on its canned products, and Boston Beer, brewer of Sam Adams, could raise prices by up to 2 percent in the year's second half thanks to the tariffs. A short passage posted on the White House website cites two recent reports that suggest such imports could hurt national security "because further closures of domestic production capacity would result in a situation where the United States would be unable to meet demand for national defense and critical infrastructure in a national emergency." "It's a huge concern. 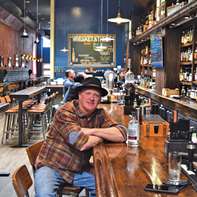 I have not seen it hit quite yet, but I know it's coming," Richard Noel, co-owner and manager of Beer Bar, says of the effects of Trump's economic ploy. Noel's downtown watering hole sells more than 100 canned beers, and he says the ramifications of the trade penalties could make their way down the supply line—vendors could raise the price of aluminum before selling to beer makers, who would raise the fee for products they sell to distributors, which, in turn, would crank up what bars would have to pay. The end result, Noel says, is likely the same. "It's mainly a tax on the consumer. Because the industry wouldn't eat it," he says. "It's almost impossible to explain that to somebody who just is looking for a cheap beer, but that's the reality of the situation." "We really hope this gets solved before the tariffs hit the beer industry," he adds. In a statement, Jim McGreevy, president and CEO of the Beer Institute, cited third-party analyses that estimated the aluminum tariff could impose a $347.7 million tax on the country's beverage industry—which includes brewers—and cause 20,291 Americans to lose their jobs. It's unclear how all this will affect local drinkers' wallets, as Trump's protectionist policies are constantly changing. "It's definitely on everyone's mind," Nicole Dicou, executive director of the Utah Brewers' Guild, says of the potential increase in production prices, a concern lurking in the heads of employees in the Beehive State's burgeoning beer industry. The guild has yet to take a position on the tariffs, Dicou says, but she hopes the nonprofit trade organization will take a formal stance after its Aug. 28 meeting. Dicou estimates the tariff could raise the price of each can by one or two cents. "It's up to them to either eat the cost or pass them on to the consumers," Dicou says of Utah brewers. Rob Phillips, co-owner of RoHa Brewing Project, says his business hasn't yet seen a price rise in the aluminum it purchases, though it's only been a few months since the taxes went into effect. But that doesn't mean the threat of a prolonged and escalating trade war isn't troubling—especially for small breweries like his. "We don't have the buying power or buying history that maybe a Squatters or Wasatch has with a vendor," Phillips says, making it difficult for smaller brewers to negotiate more favorable contract terms, since they make up such a small part of a vendors' business. James Soares, Wasatch Brewery operation manager, says he doesn't think Wasatch and Squatters have seen a price increase either. "For the smaller guys, I think it'll impact them quicker because they don't have a contract, or they buy smaller volume," Soares says. "Our contract kind of extends out." Another issue, Phillips explains, lies with smaller outfits looking to move up in the craft marketplace. "We're growing, so as we look to add brewing equipment, that equipment is much more expensive based on these tariffs," Phillips says of steel machinery potentially subjected to the 25 percent tax. "It's going to be really challenging for us to justify to a consumer why our prices are going up," Phillips says, half-joking that he wishes he could erect signs next to RoHa beer in grocery stores that would show a cost breakdown. "Initially, I think we'll try to absorb that increase," he projects. Eleanor Lewis, marketing director at Proper Brewing, says her brewery might be a bit better insulated against the tariffs, since their alcohol comes in 22-ounce glass bottles, not cans. "The only aluminum we purchase is for our crowler machine, and it's not a huge machine," she says of the equipment that fills a 32-ounce can with beer from taps. "Who knows? Give it six months and we'll see," Lewis says. Andrew Dasenbrock, president of Kiitos Brewing Co., says production costs have already gone up. Kiitos buys from an American vendor, he says, but the aluminum is mined overseas. But Dasenbrock's concern isn't just with his bottom line. "The supply chain has been dramatically altered," he says, because the manufacturer Kiitos contracts with—he wouldn't specify which one—is one billion cans behind schedule. "That's billion, with a 'B.'" That creates a delay in Kiitos getting its containers, which Dasenbrock says are delivered first to bigger breweries and regional producers because they have older, larger contracts. "All the rest of us just kind of get whatever scraps fall from the table right now." Then there's the issue of kegs, which Dasenbrock says are pricier because most come from China. (There's only one American keg manufacturer, and they might struggle, not thrive, because of these taxes, a Philadelphia media outlet reports.) "A tariff is just an obnoxiously fancy name for taxes we put on our own citizens," an exasperated Dasenbrock says. Kiitos will absorb the financial burden for now, Dasenbrock concludes. It will cut into their profits, but they won't hike prices if cans only are a cent or two more expensive. "If it gets to a nickel or a dime, we'll have to reassess that."